Vibrant in color and infused with an effortless elegance, enamel has a storied and stylish history. While precious, colored stones lend glamour and sparkle to prized metals, it’s enamel that can create dazzling dimension and depth. Enamel can also add an unexpected swath of color, be it a realistic or an impressionistic picture, a geometric design, or just a hint of a hue. In the simplest of terms, enamel is the melding or fusing of vitreous glass to metal, usually using heat (by firing in a kiln). The earliest surviving examples of enamel known as cloisonné (see definition below), are from a tomb in Cyprus, dating back to the 13th century, but it is believed that cloisonné was known to the Egyptians, as early as 1800 B.C. Clearly, this is not a just-discovered technique. What is relatively new, however, in the world of enamel is “cold” enameling, which really is not enameling in the strictest sense, but rather the application of various formulas of resin, plastics, or paints that result in substantial areas or blocks of color. While these applications might be dubbed “enamel,” they are achieved by a different process, one that is much simpler to execute, and doesn’t usually require oven-firing. Today, we see enamel or cold-style enamels used lavishly in the jewelry of Schlumberger, David Webb, Silvio Hidalgo, M.C.L. by Matthew Campbell Laurenza, as well as in bijoux from Hermès, Tiffany, Cartier, and Gucci, La Nouvelle Bague, and Frey Wille, among others. Cloisonné: This is among the most common styles. Blocks of color are achieved by building little compartments or cells on a metal surface, into which the glass crystal—molten or powdered—is applied and kiln-fired. The partitions’ walls are created by soldering strips of metal or wire to the surface of the object. The resulting little “boxes” are called cloisons (cells), hence the name. Plique-à-Jour: This technique results in a very sheer “window” of nearly-transparent enamel, and the name plique-à-jour underscores that—meaning more or less “letting in daylight.” Like stained glass, if held up to the light, it boasts a delicate, diaphanous film, so different from the effects achieved with cloisonné and champlevé. Plique-à-jour enamel is, in fact, constructed in a manner similar to the assembly of stained glass: A trellis or web of metal constitutes the framework of each area that will be enameled, but with no support metal under the shapes. The result is a fragile-looking network of ethereal color, and, not surprisingly, it is one of the hardest techniques for an enamellist to master. 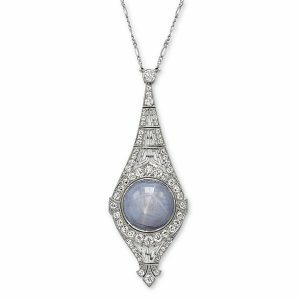 It was particularly popular in Art Nouveau objets and jewelry. Guilloché: Think Fabergé and you are likely thinking guilloché, which means “engine-turned.” This technique is generally used on large surface areas to be embellished with enamel; the underlying metal features a mechanically-cut pattern—lines, squiggles, geometrics, anything highly decorative. Translucent enamels are applied over the engine-turned designs and the result is a gossamer, see-though field of sheer color under which is a striking and complex design. Champlevé: This process achieves a look that is somewhat similar to that of cloisonné, but is created differently, in an almost opposite manner. The cells for champlevé are carved into the surface of a piece of metal: The metal is gouged and the shapes to be filled in with glass are incised, and so the name, “elevated field,” reflects that. (The metal, therefore, must be thick, and so this technique is often executed with more base metals, like copper.) The areas that are not carved constitute the walls of the partitions. Enamel, whether molten or in crystal form, is then applied into the hollowed-out sections, and as in cloisonné, the piece is fired.